There is a lot of talent in the independent artist community. The vast majority of this talent is very good. Once in a while there comes across my desk an artist that is what I would consider a "stand out". Barb Elyett is one of those. Her project "The Simple Side" is a CD that you must listen to. Not only is every track beautiful, filled with her gift of voice, but well produced, and spirit-filled. Elyett is a Canadian, but has the potential of being a force in the American market with the right promotion efforts. Her stand out vocals and writing are powerful and effective and need to be heard. I have listened to every single track on this CD several times. There is not one that is less than class-A. My favorites include "Come To Me", "Home", and "Abandoned Nets". The ad lib intro on "Home" are catchy and are effective in getting your attention for the rest of the song. Feel free to request any of Barb's track on Christian Mix Inet. When I listen to a CD, there are generally two different attitudes I take. One is the radio airplay mindset, the other is just enjoyment of a song. There are several radio airplay tracks on this project. Too many independent artists get overlooked by the politics of radio programmers. I pray that Barb can influence U.S. radio programmers to give her a listen. With the hard-core "hit oriented" music directors who get dozens of CDs every week, I encourage them to give her a listen. 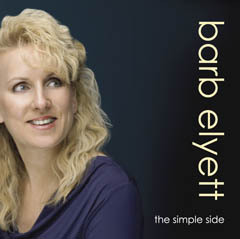 As a Christian Mix Inet listener, I encourage you to request Barb Elyett. You will not be disappointed.